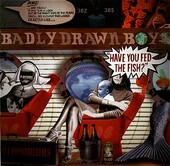 In Music We Trust - Badly Drawn Boy: Have You Fed The Fish? UK songwriter Badly Drawn Boy steps it up a notch, following the release of his Elliott Smith-esque About A Boy, the soundtrack to the Hugh Grant movie. However, on his latest, Have You Fed The Fish?, he avoids the Elliott Smith comparisons, finding his own voice, all while writing rock songs with one foot in the pop door. "You Were Right" is a prime example of this. The song is semi-jangle-y and pretty upbeat, propelled by a rhythm section that knows how to play to the strengths of a good rock song. Badly Drawn Boy creates a solid vocal melody line that gives the song a feel-good pop vibe, the lyrics telling a story you want to follow. Then there is "40 Days, 40 Fights", a quirky, hook-laden sugary pop song. The rhythm section follows BDB's lead, as he takes you through a boppin', toe-tappin' song that reels you in hook after hook, while you soon find yourself singing along in no time at all. The very definition of a catchy pop song that doesn't beat it over your head or shove itself down your throat. "Centrepeace" is a beautiful 2-minute interlude, an orchestrated instrumental that helps bring you back, your mind by now (it hits on track 8) lost in the paralyzing songwriting world of BDD. Other notable songs include the full-blown pop of "How? ", complete with strings and horns. The groove-laden, soulful-ness of "The Further I Slide". And the magnificent carnival-pop songsmith of "Tickets To What You Need," a song that showcases BDB's ability to write a poignant song that doesn't take itself too seriously while still having something to say. With only his third full-length under his belt, and plenty of singles and EPs, Badly Drawn Boy has crafted a nearly timeless pop-rock record that will have you singing along, laughing out loud, and jumping for joy, reactions sought after by musicians, but rarely captured, let alone on one disc. I'll give it an A-.